The sunspot that I have sketched two days ago has grown in the meantime. The main spot has not changed much but the surroundings have changed considerably. To the left the sunspot as I have sketched it this afternoon around 4 PM. The telescope was again the Meade ETX-125. Eyepiece Meade Super Plösll 26mm with 2x Barlow. To the right the same section from the SOHO satellite image. This time I also have mentioned the scale and the orientation of the image. I have determined the orientation by switching off the guide motor (not practical if you want to go on observing). The part of the sun that moves out of the field of view is the West. Because in a Meade ETX the light is reflected three times North is 90 degrees clockwise from West. The image from the Soho satellite is rotated and mirrored to get the same orientation as the drawing. This result shows that sketching can result is a quite actual represenation of the image. Especially after some more practice. The distances between the indivual sunspots are quite good but I made the main spot too large. Because it is so difficult to take pictures through the telescope in Curaçao because of the ever present strong wind I want to try to manage sketching behind the telescope. Starting during a day session is preferable so I decided to take a look at the sun. There was a sunspot visible today so that was a good opportunity. 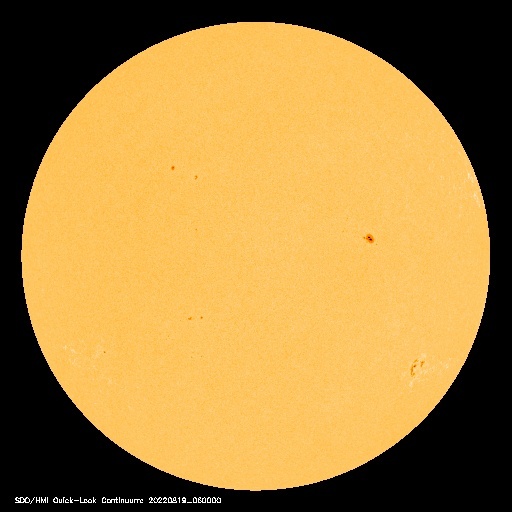 Yesterday when I visited the website of aac Eta Carinae, I immediately noticed the visibility of 2 large sunspots in the SOHO-image on this website. Yesterday I didn't find the time to carry the telescope outside, but today at the end of the afternoon I was able to do that. The ETX-125 with solar filter pointed at the sun showed a very nice group of large sunspots. After quickly connecting the Nikon D90 to the telescope I was able to take some shots. The best image has been processed in Adobe Photoshop and is shown below. The exposure of this picture is 1/250 seconds and the sensitiviy was ISO 200. On March 20, 2010 in the early hours of the evening there was a conjunction of the Moon and the Pleiades. This conjunction was very close and some of the brighter stars of the Pleiades were covered by the Moon. This image is a combination of 5 pictures made on March 20 at 9:47 PM with a Nikon D90 with the zoomlens at 105mm, opening F/6.3 and exposure of 1.6 seconds. The images are processed and stacked in Imageplus 3.75. At the end of this afternoon the sunspot group 1046 (left of center in this picture) was still about the same size as in my previous observation. There is a lot of activity but that is not shown with the type of filter that I am using. On the website solarlive.nu an animation can be found of a solar flare that has been seen this morning in this group. The first group (1045) is to the right in the picture and almost disappears over the edge. In this area there are a lot of bright (hotter) spots. Comparable hot spotes can also been seen at the left side in the picture; so it is probable that this is the first sight of a new group.